Amidst extravagant assembles in Milan, Jil Sander's Rodolfo Paglialunga delivered a simplistic, androgynous collection that stood out this season. Whilst Paglialunga, is one of the industry's newcomers- last time we saw him was at Vionnet few seasons back- this season's collection had everyone talking. 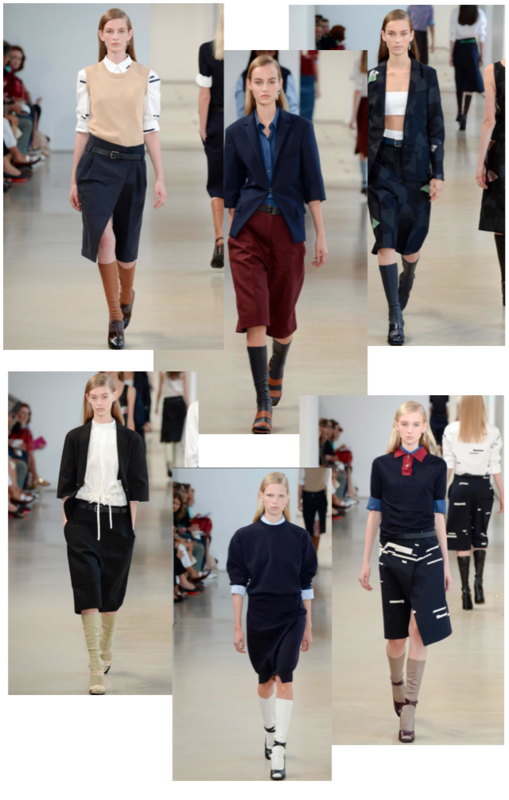 His collection did have some fit issues in regards to bunching of the culottes and awkward accidental nods to MC Hammer, but never the less it's simple beauty happened to shine through in the end. Inspired by the tailored lady of the 1930s- with a slight acknowledge to Roman Holiday- sharp collars and creative layering gave dimension to the anti-Spring palette of camel,navy, and maroon- right up this black cat's alley. Paglialunga, along with the rest of us, is still keeping the schoolgirl trend alive with the help of knee-high socks and such. Other than the clothes themselves, the natural hair and makeup kept the feel modern, and still maintaining a "retro meets today" vibe.